Nursing faculty and students and Outreach staff have collaborated the past two years to provide free health care services to the people of Sekondi in the western region of Ghana. This year, they adopted the pediatric unit of the Effia-Nkwanta Regional Hospital, donating medical supplies, stuffed animals and children’s books. The hospital held a ceremony to unveil a plaque, commemorating Auburn’s support. Representing Auburn were Royrickers Cook, associate provost and vice president of University Outreach; Elizabeth I. Essamuah-Quansah, director, Outreach Global; Assistant Clinical Professor Valarie Thomas, nursing; and Associate Clinical Professor David Crumbley, nursing. The Hon. Andrew Mercer, a Member of Parliament for Sekondi, and the Hon. Anthony K.K. Sam, mayor of Sekondi-Takoradi Metropolitan Assembly, were also present with hospital staff and volunteers. Cook and Essamuah-Quansah reaffirmed Auburn’s commitment to the citizens of Sekondi with additional medical supplies, educational resources, training programs and health care services on future visits. 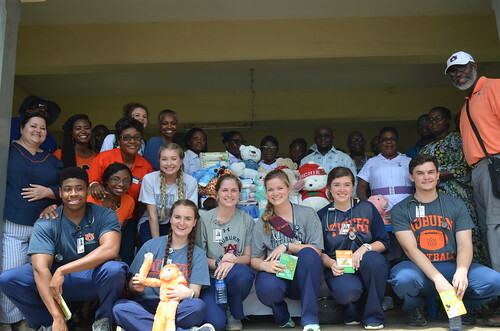 For the free public health care program in Sekondi, Auburn nursing students and faculty provide comprehensive screenings of ears, eyes, blood pressure, glucose testing and general health examinations. The goal is to promote health and wellness, good nutrition and eating habits among Sekondi citizens.